Let us learn Chinese languages, cultures and area study through this website. You can also visit my contact page to have conversation with me. Enjoy! The educator made listening and speaking prompts follow the ACTFL Proficiency Guidelines for Chinese, 2012. Student performance graded according to the ACTFL Performance Descriptors for Language Learners and the educator made rubrics. 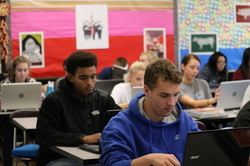 Students learn to use computer, technology and digital media according to the 21st Century Skills Map for World Languages, the NCSSFL-ACTFL Can-DO Statements, the ISTE Standards for Students as well as the teacher made lesson plans, assessment and rubrics. The educator made reading and writing prompts follow the ACTFL Proficiency Guideline for Chinese, 2012. Student performance graded according to the ACTFL Performance Descriptors for Language Learners and the educator made rubrics. Using digital media and information literacy, students create their own essays, power point presentation, blogs and websites using both Mandarin Chinese and English in order to communicate and collaborate with students within school and beyond around different global communities regarding different topics. The educator made rubrics use reference according to the Common Core State Standards, ISTE Standards for Students 2007 and 2016 and other academic national and state standards.